According to former President Barack Obama, only the graphic novel format had the expressive palette capable of truly capturing his eight years in office. 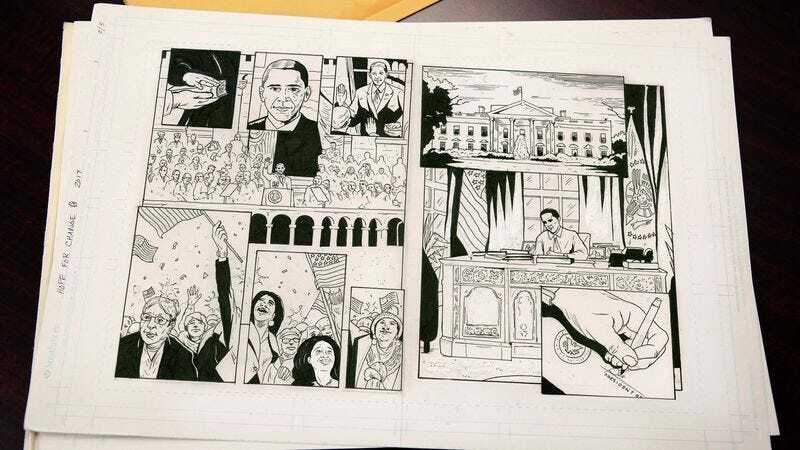 The 16-page packet of artwork and sample issues, which Obama confirmed he has also mailed to Fantagraphics Books, Dark Horse Comics, and DC’s Vertigo imprint, is said to serve as a proof of concept for what he envisions as a sprawling eight-volume memoir of his presidency. According to Obama, creating an authentic representation of his two terms in office has required him to use every tool of the comics medium, from dramatic splash pages in which he appears silhouetted behind the Resolute desk, to an extended dream sequence set on the eve of his 2012 reelection, which he said takes “definite cues” from the casual surrealism of graphic novelist Chris Ware in order to fully realize the emotional truth of the moment. Discussing his efforts to capture events on the page just as they happened in real life, the former commander in chief admitted he owed much to Y: The Last Man co-creator Brian K. Vaughan, whose “masterful blend” of rapid-fire action and political intrigue influenced his own approach to the bin Laden raid, which will appear in Volume #4: Infiltration & Exfiltration. Obama said he created a kinetic sense of motion by extending SEAL Team Six’s HK416 assault rifles into the page’s bleed and lettering the onomatopoeic “chh-chh-chh” of the helicopters in such a way that the words wrap around their whirring blades. Despite Renegade’s dense political narrative, the former president was quick to note it would also include moments of humor and even tenderness, such as episodes imagined from the perspective of first dogs Bo and Sunny Obama, and recurring romantic vignettes about first lady Michelle Obama, which will be painted in watercolors to provide a stark break from the more rigid inking used to portray his actions as the nation’s chief executive. Obama stressed that, overall, his series would be “gritty, heady stuff,” and more akin to a novel than traditional superhero fare.